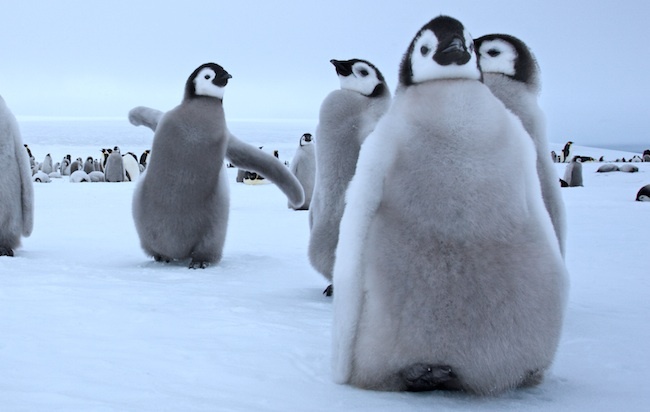 It's Penguin Appreciation Day, and thus, here are adorable videos of penguins! If you’re at all stressed today, we have some good news for you/a giant explosion of cuteness. That’s right, it’s Penguin Appreciation Day. OH YES OH YES. Meaning that the time has come to celebrate the weird and wonderful and impossibly cute furry animals of which we literally can never see enough. So sit back, relax, and let these adorably expressive penguins slap wide grins on your faces. Some of the videos are gently educational, and others are all about the FUNNY. Here we go (starting with funny, because obvi). If that literally got you up on your feet doing a happy dance, mission accomplished! To follow that up, here’s something else we appreciate: Dancing penguins from Happy Feet Two! Aaaaaaand here’s David Attenborough sitting in a sea of penguins, because of course he is. Baby penguin getting fed? Yes please. It might be true that cats rule the internet and probably will forever, but we’re so glad that penguins are getting their day to shine, too. They are smart (and yes, clumsy) creatures who clearly form tight bonds with their family units. And we’re still learning so much about them! Plus they wear tuxes…so they’re swinging some serious cool factor. HAPPY PENGUIN DAY!